NOT to be confused with BC Racing!!! Please keep in mind that this is prior to the latest revision; in the latest model, Maruha has increased the rear damper stroke by 20mm, accompanied by OEM-style 20mm extended steel stamped top hats. BTW said extended top hats are perfect for anyone wanting an extremely high quality extended top hat at a reasonable price; anyone building DIY Bilstein coilovers? Back to topic; my set was bought used on YAJ and so I took it apart to clean, inspect and measure as much as I could. The version I have comes with 8/6 kg/mm springs (front and rear respectively) and 15-click damping adjustment. There's also a "street" version with lighter spring rates I believe. Both use OEM top hats and OEM rubber bushings, although there's an option for pillow ball ones (which has no real benefit besides reducing side loading on the damper shaft; not much of an issue anyway). Maruha includes machined aluminum adapters to seat the narrower coilover springs and locate them properly in the OEM top hats. The design allows you to adjust height separately from spring preload, which has its' benefits (no need for helper springs, can dial in the available bump/rebound travel ratio) but comes to a cost; less stroke than more "conventional" units, as the damper body needs to be physically shorter to accomodate the height adjustment. I believe my units were set per Maruha's reccomendations; rears had a 15mm preload while fronts a 20mm preload. This seemed like much, but it can be attributed to the limited overall stroke and the fact that this leaves you enough bump stroke in expense of rebound. Speaking of stroke; rears were measured at 60mm while fronts at 80mm. This is significantly less than OEM NB2 Bilsteins (35mm to be exact), which have a 115/95mm stroke respectively, but can be attributed to the harder springs normally used in coilovers, and (as mentioned) to the inherit design compromise to accomodate separate height adjustment. I had contacted Maruha, and bought new OEM rubber "donut" bushings for the top hats, extended top hats (which I will not use on this set up) and new-style bumpstops. The new bumpstops are significantly shorter (20mm total uncompressed length) compared to the older ones (38mm long), but are much stiffer. This means that bumpstops will be engaged much later, but much more abruptly. Will comment back on that once I have some real-world feedback. Just as a reference, the old-style top mounts that originally came with my suspension had turned to dust on the rears (1-2mm of residue was all that was left), indicating frequent bottoming out. 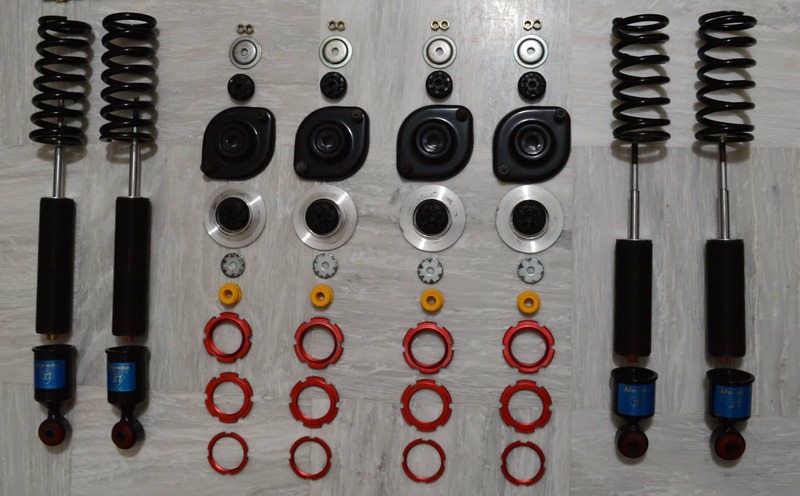 This is something that worries me; it should be OK with the original springs, but I was planning to go down to 6/4.5 kg/mm, as I do my fair bit of mountain passes drives, and potholes are frequent. However, this means more travel is needed for the same load; thus more frequent bumpstop contact. Seems I will be sticking to the original supplied springs for now. I can see their reasoning (they would ask people to ship back to them, labor cost is high and Maruha is a relatively small business, therefore turnover time would be long and most probably was going to cost more to service than replace), however I would like to try and see what's possible when time comes. Moreover, as per Maruha, these use 46mm pistons; same as Bilstein, and Bilstein parts (including pistons, seals, shim stacks etc.) can be purchased individually. Last edited by HarryB; 01-03-2019 at 02:10 PM. New bumpstops are a TIGHT fit on the shaft; while ID is the same as the previous one, the material being stiffer means they expand less. It also worries me that in the rear, the space left between the bumpstop shim and the top of the damper unit with the damper fully compressed is 14mm. This means the bumpstop can compress only for 6mm before the damper bottoms out internally, and I am not comfortable with this (although compressing these stiff bumpstops by 6mm will take some force). I will conctact Maruha to see their point of view, but most probably gonna turn some solid delrin bumpstop spacers on the lathe. That's a non-issue at the front, as the damper rod retracts fully, meaning that the bumpstop would works as it should. Front springs are longer than rears. This goes against conventional wisdom, as stiffer springs compress less for a given load. For reference, fronts are 200mm while rears are 180mm, both sets are the typical (for coilovers) 2.5" ID. The nuts that retain the damper rod on the top hat were both 14mm narrow-style ones, as seen here (photo from Maruha's website). OEM NB2 has a larger flanged lower nut to spread the load onto the top shim, and a narrow one on top. Went on and replaced the lower ones with OEM I had in hand, although I do not see this being a problem. Maruha advises using grease on the threads when re-assembling them, to avoid corrosion and frozen together parts. I typically use copper grease, but had none, so I used CeraTec brake pad grease instead. Time will tell if that is OK. Grease attracts dirt, so plan on ordering coilover socks to keep most of it out. I also found two metal clips, that most probably are used to retain brake lines on the front; however I have absolutely no idea how they are supposed to be attached to the damper body. Will take some pictures in case any of you knows. Last edited by HarryB; 01-03-2019 at 02:24 PM.